Microsoft Outlook lets you associate photos with the contacts in your address book. And most Facebook users have profile photos associated with their accounts. Wouldn't it be great if you could download those profile photos into Outlook? 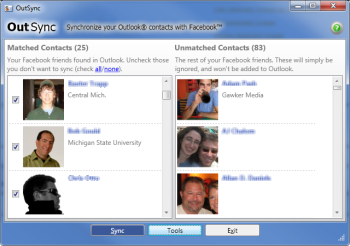 That's the idea behind OutSync, a free utility that copies photos of your Facebook friends into matching contacts in Outlook. In a minute or two, OutSync should find Facebook friends that match entries in your address book. By default, it will select all of them for syncing, but you can manually remove any contacts you want by clearing their accompanying checkbox. From there, just click Sync and you're done! In my quick, informal test, OutSync worked exactly as advertised, pulling a couple dozen photos from Facebook into Outlook. Great stuff!